This won't be the first article I write about Destiny. It's difficult to say where I fall on the love or hate scale with Destiny and as I feel that out more and the game evolves (hopefully) I'll have more to say. There are things that I really love about the game and that keep me coming back but there are other aspects that I'm really disappointed in and still more that infuriate me. With all of these running through my head at once, pinning down my exact opinion is impractical. A walk through each of these disparate streams may bring us to a common source. The plot of Destiny is my biggest disappointment. What was hyped from the start was a deep story and expansive lore; it's short and falls flat. The missions and enemies are largely the same basic premise: go to a place, scan a thing, defend the thing, rinse and repeat. The few bits of background story and animations revealed through the story missions are interesting, but they lack the depth I've come to expect from Bungie titles. I'm left hoping that these missions are a lengthy introduction to the world of Destiny. There is more than a small hope for this scenario. Buried within the Grimoire (card entries detailing specific enemies, locations, NPC's, etc.unlocked in the game and viewed through your Bungie.net profile) are hints at deeper story lines and secrets kept by key members of the tower. The Destiny subreddit is alight with various theories about where the story goes from here and I've been impressed by the plausibility and wealth of evidence gathered for some of them. For now they all remain shots in the dark and I'm forced to hope that some of them pass muster in the coming expansions. 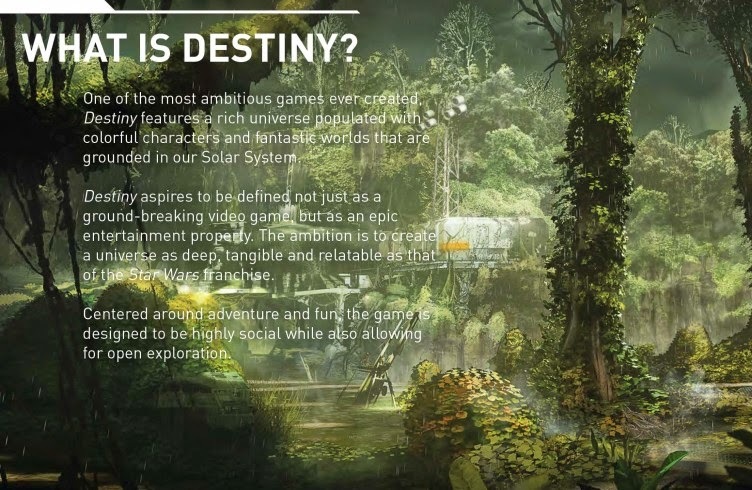 One of the first images from Bungie detailing what Destiny would be. Not there yet. I've other bones to pick with Bungie aside from the disappointing story. 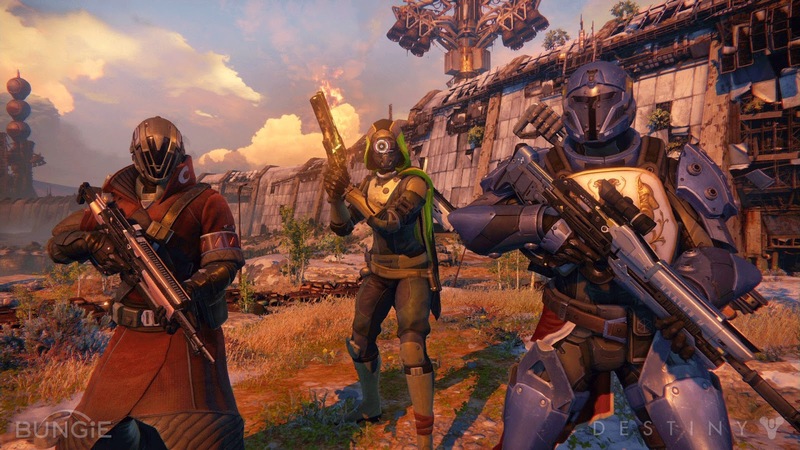 As a longtime follower of Bungie's games, I can confidently say that they have rarely missed the mark when it came to multiplayer. Marathon, Myth, and Halo all had really incredible multiplayer systems. Halo and Marathon before it helped to set the template from which almost every FPS molds it's multiplayer. I had high hopes for Destiny. Was I expecting something ground-breaking from the Crucible? No, I don't think so. 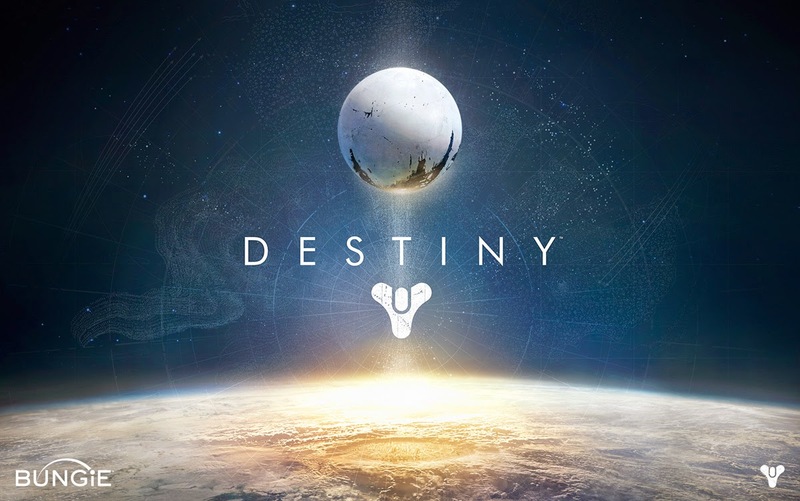 I expected a carefully balanced experience, something that Bungie has typically been noted for. The Crucible is a mess. Certain exotic weapons rule the day in there, and the classes are poorly balanced for PVP. The Titan has a shoulder charge that hits almost as hard as its super ability, the warlock has ridiculous area denial and area of effect blasts (not to mention the damn self-resurrection with the Sunsinger subclass) leaving the hunter with largely ineffective abilities by comparison. One of these things is not like the others, one of these things just doesn't stack up (in PVP). The Crucible that Bungie wants is a place where any Guardian can enter and prevail. Players should be able to tailor their builds and loadouts to fit the tactical situation or their personal preference. As i stands, there is little room for diversity. Go into the Crucible without an auto rifle or take a sniper rifle over a shotgun or fusion rifle and you're practically target practice. Beyond that, there is the question of which Auto Rifle, Shotgun and Fusion Rifle. This very issue in the Crucible has been mentioned by Bungie staff but little has been done to deal with the issue. Some specific issues were addressed concerning one exotic weapon in particular- the Vex Mythoclast - in the latest hotfix, the move to better balance it in PVP has unbalanced it for PVE and rendered it nearly useless. Until some drastic changes are made, I'm afraid Bungie will continue to see-saw the balance issues. If there is an equilibrium to be found, we are far from reaching it. With all these issues, why am I still drawn to play Destiny almost every day? What redeeming qualities could it possibly have? To be perfectly frank, I'm still figuring that out. I enjoy the experience of playing the game. The combat (outside of the Crucible) is fun and challenging in the right situations. I'm currently level 28 and I'm about halfway to 29. I can't place where all this fun is coming from. The best I seem able to manage for now is that I enjoy the way the game lets me shoot things. Perhaps I've become a slave to the grind. I want need to hit level 30, but don't know what will be qualitatively different for me when I get there or if I'll even consider myself "done" with the game when I hit that mark. I think my experience parallels Gabe's time with Destiny. We are both hopelessly ensnared by the combat/loot cycle. I shoot things in the hopes of acquiring precious things from them. While he is content to let the game take him, I have had a tougher time of it. I really enjoy the higher level content; the Nightfall Strikes and the Raid. The events are a blast to participate in and I'm really happy to be able to play with friends again (although I'm still burnt over the lack of splitscreen). Whatever the cause or result, Destiny has me in its grip.